Women entrepreneurs today struggle to access capital they need to spur economic development.Though the constitution of India provides gender equality, female entrepreneurs still face obstacles in getting their projects funded, said Smt. K C Rosakutty, Chairperson, Kerala Women's Commission. 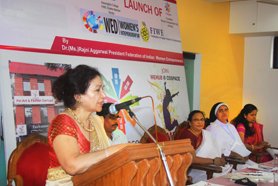 She was speaking at the occasion of the inaugural launch of the Women's Entrepreneurship Day (WED) at a function conducted by CoSpace Foundation Women's Empowerment HUB (WeHuB) and the Assumption College entrepreneurial Incubation Centre at the CoSpace Auditorium at Panampilly Nagar, Cochin. She also said that the presence of a patriarchial society throws many challenges for women entrepreneurship. Granting women inheritance rights equal to men’s increases their access to physical and human capital. Launching of Cochin Chapter of Federation of Indian Women Entrepreneurs (FIWE) by Smt Rajni Agarwal National President FIWE, Smt KC Rosakutty, Chairperson, Kerala Women’s Commission, Rev.Dr.Sr.Mercy Nedumpuram, Principal Assumption College, Changanacherry, Jincy Sunil, Trustee Cospace Foundation also seen.The Cochin Chapter of the Federation of Indian Women Entrepreneurs (FIWE) was also inauguarated at the same function by its National President Dr Rejni Aggarwal. Speaking at the occasion, She said that women are still treated as second class citizen when it comes to entrepreneurship while the fact is that women entrepreneurship helps the family, community and the whole nation. Given an opportunity, women are more likely than men to plough earnings back into their communities, fostering prosperity and stability, she said. The function was presided by Rev. Sr. Dr.Mercy Nedumpuram, Principal, Assumption college, Changanachery.Jessy Mathews, CEO, Business Incubation Centre, Assumption College, Pradeep Kumar, Joint Director DIC, Susan Abraham, COO, Cospace, Jincy Sunil, Trustee, CoSpace Foundation also spoke at the occasion.UN is going to celebrate the inaugural launch of Women's Entrepreneurship Day (WED) on Wednesday, November 19th, 2014 at the United Nations. 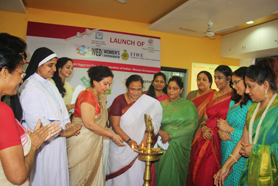 Celebration of Women’s Entrepreneurship Day (WED) and launching of Cochin Chapter of Federation of Indian Women Entrepreneurs (FIWE) by Smt KC Rosakutty, Chairperson, Kerala Women’s Commission, Smt Rajni Agarwal National President FIWA, Rev. Dr.Sr.Mercy Nedumpuram, Principal Assumption College, Changanacherry, Jincy Sunil, Trustee Cospace Foundation, Susan Abraham, COO, Cospace Foundation also seen.